Apple has already released iOS 9.3 and those who have upgraded their iPhone and iPad with the new version are surely enjoying some very cool features. 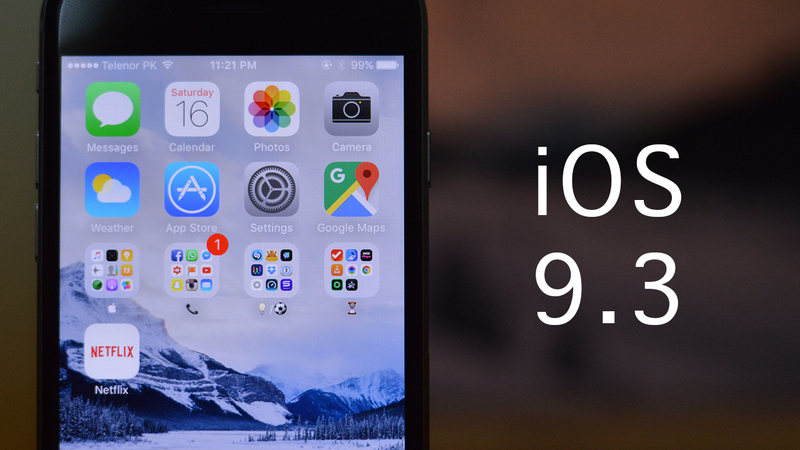 Since the launch of iOS 9, this is the third major update to the operating system. With this update, Apple has added some quite interesting and long awaited features. Let’s check out what the operating system has in store for us this time. Night Shift is one of the most interesting features that iOS 9.3 offers to make you healthier. It uses your device’s geolocation and clock to know when it’s sunset and then shifts the colours automatically to the warmer end of the spectrum. In the morning the display returns to its normal settings. If you are habitual of reading news or checking e-mails before going to sleep, the new feature ensures that you don’t get too much of harsh blue rays at night that might disrupt your circadian rhythm. With iOS 9.3 you can protect your sensitive Notes with Touch ID or a password. In this era, when we prefer keeping all the information under one roof, smartphones, the feature surely adds security to our vital information like medical reports or banking details. iOS 9.3 has got a big boost in the 3D Touch shortcuts which counted very few previously. Apple has added a range of new shortcuts for all the standard pre-installed apps that you can now access easily from the home screen. Now you can use 3D Touch to quickly alter Bluetooth, switch on/off Wi-Fi and to perform many such tasks. Usually iOS comes with a number of default system apps which cannot be deleted and also take up a lot of room on your home-screen. However, now you can hide them by packing them away in a separate folder. iOS 9.3 also takes care of students who can now share one iPad among themselves. Each student can have his or her own account. This feature of a brand new classroom app helps the teachers to organize and track lessons, classes and progress. Apple’s News app has also gone through slight improvement, with addition of nice features. Trending topics and picks from Apple’s Editor can be read in the ‘For You’ section. The app now loads stories much faster and the landscape view is no more restricted to the iPad. With the new version of iOS, Apple Music has become more feature rich. Also the Nearby feature helps to find parking, restaurants and petrol stations quickly. Another app, Health, has also been improved in iOS 9.3. Now it displays the information obtained from your Apple Watch so that you don’t have to fiddle between two apps. The UI has also been enhanced for accessing the options easily.